The Internet has changed the practice of public participation, connecting the different pieces and creating an (online) public participation ecosystem. Like other ecosystems what happens in one part of the ecosystem has an impact on the other parts of the ecosystem. I’ve created this diagram to help identify the main pieces of the ecosystem. While social media websites form part of the ecosystem, our experience suggests that social media is more than a piece, it is the air or the water that connects one piece to the other. Social media is what allows information to quickly flow from one piece of the ecosystem to another. 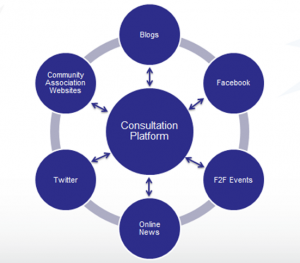 Getting your consultation project in the news, making it easy for people to share your Tweets, creating daily Facebook posts, adding new content to your website feeds are all part of a successful online engagement program. With social media, being present and active on as many elements of the ecosystem as possible will drive awareness, participation and engagement in an online consultation program. 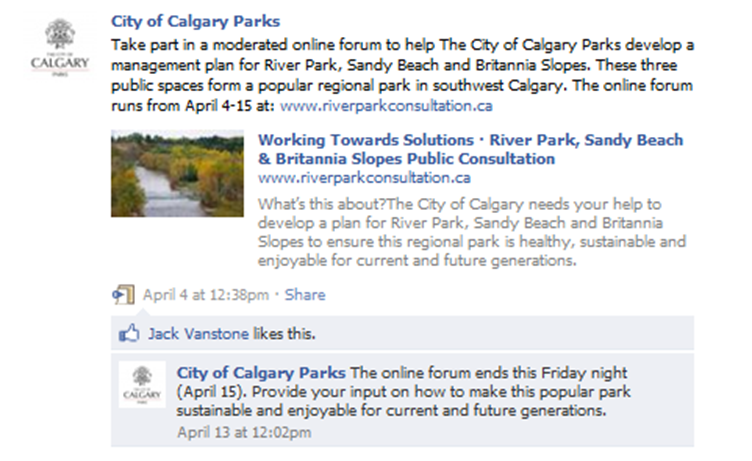 It was while working with the City of Calgary on the deployment of an online consultation program that I first started to think about public participation as an ecosystem. The story of what happened should help (I hope). We were called in to help the City because a previous consultation on the issue had generated a strong public backlash. Residents of the City felt that the previous consultation had failed to provide ample opportunity for all to participate. In these scenarios, decision-makers often look to online consultation as a way to ensure that people can have their say. Given this, the main objectives of the program were: to reach as many people as possible; to get them to participate online; and, to demonstrate broad participation to decision-makers. Our team was fortunate that the City was open to using social media in response to its objectives. Time was of the essence and the issue was on the media and the politicians’ radar. Here’s what we did, what happened and what we learned from it. 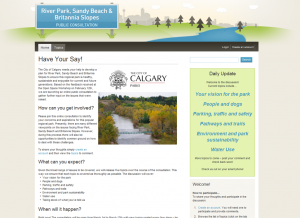 We created an online dialogue platform and worked with the City to create a set of consultation topics with prompts. We also had to develop the website privacy policies, acceptable use policy and moderation policy. We then set up a dedicated Twitter account that we used to share information and updates about the consultation. We integrated the Twitter feed directly into the consultation platform, allowing website visitors to see and interact with the social feed. We also worked with the City’s communications team to get our content onto their social channels. Every day, the communications team re-tweeted our content and shared our information on their Facebook page. We also worked with the City’s communications team to get some PR for the project. While most practitioners will tell you that the quality of the intervention and participation is what matters, we have found that participation numbers are just as important to decision-makers. Given these two things, we measured the online activity and provided detailed reports to the City team that depicted both the breadth and depth of participation. Launching an online consultation can be a scary thing – each time you do it you are starting from scratch, with no one signed up. With this project, there was a small group of people actively engaged in the issue (those in the affected neighbourhoods). When we launched the consultation, the initial level of participation was less than hoped. In response to this, we focused our efforts on social media to help us get the word out. Each day, twice a day, we tweeted something about the consultation from our Twitter account. We also worked with the City’s communications team to get our message onto their Facebook page. The city had a sizeable social media following and once we tapped into it, we started to see an uptake in participation. We were lucky enough to get some elected officials to re-tweet our messages and that’s when participation really started to grow. 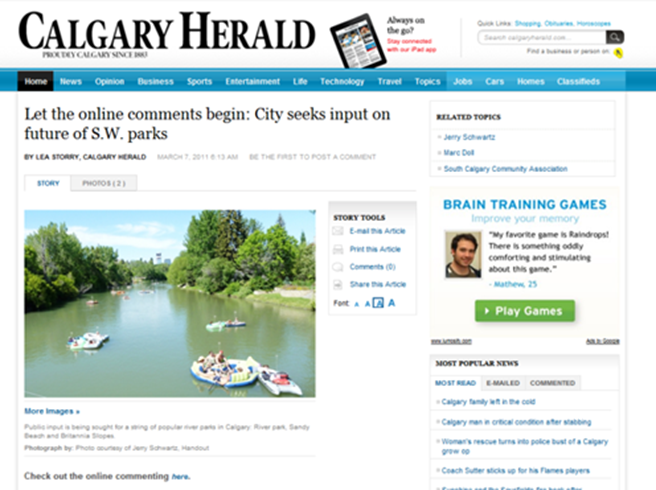 Our best break came when the Calgary Herald decided to run a news story on the consultation, and included a link to the online consultation website. Immediately we noticed a spike in traffic to the site. The spike came from two sources; the first was the newspaper and the second was the echo from social media. When we looked into the social media activity, we found that people shared the news story with their friends. The ability for news stories to drive online participation via social media was confirmed on a recent project with the City of Ottawa, where 8000+ people participated in an online survey. At the end of the online consultation, we were able to help the City address its objectives. We reached a broad range of participants, we engaged in a healthy online dialogue and we were able to quantify participation in response to decision-makers’ needs. This process, along with the in-person events, resulted in the proposed plan receiving unanimous consent at the City Council. Finally, if I’ve missed something, I’d welcome your thoughts. Please post a comment, or reach out to me online. Click here to learn how Thornley Fallis can help you conduct public outreach that is purposeful and engaging.